Now before you go thinking that this should have come out before the article on the Joe Philp Fun Day, it should, but couldn’t as the whole thing was top secret. Visitors to the workshop were sworn to secrecy if they twigged what was being mended. Now the event is over we can finally release the details, for the record, of what we actually found when the Flames were unpacked and how we decided to mend them along with a few anecdotes to make you smile. When you have a deadline to get something done it usually ends in success, at least providing enough time is allowed. So it was that a get-together for Joe Philp had been planned and it was thought it would be a good idea to get his two old Flames (of the fabric kind) at least inflatable. First problem was where were they? G-BGOO alias Mr Flame had been seen at Bristol but last we knew G-BLKU, Mr Wonderfuel, was part of the BBM&L display at the Museum of Science & Industry in Manchester. Maybe Bishy had them in his barn. We contacted Celia at Zebedee, she spoke to Pete Bish. He didn’t have them but thought the BBM&L had G-BGOO and contacted Tim Turner who mailed us to say they had them both but one was worse than the other (or was it one wasn’t too bad?). Turned out that nice David Hopkins had them in the new BBM&L store at Pidley, so we called him. No problems, he had them both on a forklift in the carpark when Jane arrived to collect them. We unloaded them onto a couple of pallets and put them into ‘round to it’ pile. A couple of days passed until the smell of old balloon could be stood no longer and after a fine cup of Tetley’s finest we tentatively unwrapped the oldest looking Colt bag and heaved what turned out to be G-BGOO, Mr Flame, onto the floor. The skirt was missing and the mouth, including the mouth tape, was a bit of a mess but quite repairable. There were two flying wires missing but these turned up in the bottom of the bag. Safety pins, it appeared had been used in an attempt to attach the loose side of the banner to the envelope and these had gone rusty and come adrift. On first inspection it didn’t seem too bad. The damage to the mouth we would repair and the wires refitted. The banner we’d leave as it was never designed to be sewn or pinned down but during windy tethers did have a habit of rolling up and safety pins were used to try and stop this. Luckily we had a pile of left over panels from a big repair job that were more or less the exactish colour. After much fettling, cutting and sewing the new panels were in, the wires re-fitted and the old chap seemed much happier. We headed for the pointed end and found the triangular rip-panel. All seemed fine and the Velcro seemed in reasonable nick, the Capewell went together with a resounding click. Crikey. Moving down, the dump panel was all in one piece and even had a line attached. It didn’t even appear that porous and was light on mildew. All in all this didn’t seem too bad so we assumed it must be the better one. By days end it was all done we put the Velcro panel in properly and stuffed it back in the bag. Mr Flame was good to go. On reflection it would probably pass an inspection with a bit more work, and a set of socks on the wires would help, but that wasn’t the plan and so could wait for another day. “We ought to have a squint at the other one before we go.” Said John. I wasn’t sure whether that was a question or not. He certainly had the bit between his teeth. Pulling G-BLKU (Mr not-so-Wonderfuel) out was not amongst the most recent pleasant experiences we’d had. It stunk. No, actually, it really whiffed. This must be the worst one then. Well we bit the bullet, cleared the floor and pulled the mouth out. Not much damage to the skirt or mouth but boy was the fabric thin. This wouldn’t even get near the ‘decorator’s blanket criteria’ for a fail. We were careful to keep it at arms length. Starting up the envelope, apart from a large degree of suspected porosity, it seemed intact. Maybe the rumoured split wasn’t there or the mildew had healed it up. We poured a small livener and pondered the situation. “Tell you what, its pointy at the top so if it is split it will be easier to find”. Plan B came into force and we dragged it round and worked from the top down. Seconds later we’d found the tear. It did indeed finish at the top, up the back of the rip panel. Tentatively we followed it down and down, down, and down a bit more then, just past the dump, it got really bad. It appeared a large chunk was missing. The split went on past the missing panels. It ran at least three quarters the way down the envelope. This looked decidedly bad. By now we two were rather pongy, white and coughing like chimney sweeps so decided ale and a viability discussion was needed so headed for the Swan. 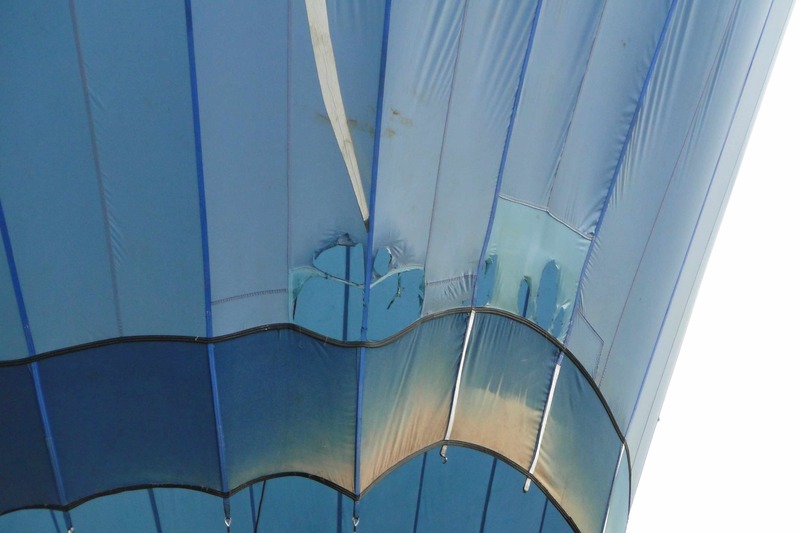 Now, I can’t be sure but I seem to recall it got snagged at a show somewhere and being already a bit of a liability to inflate (never mind fly) the notion was to exaggerate the rip and report back to the office that it had torn and split from top to bottom. I may be wrong but whatever the outcome, a new, rather characterless Flame appeared without arms later that same year. Next morning dawned bright and sunny and almost immediately it started to rain. 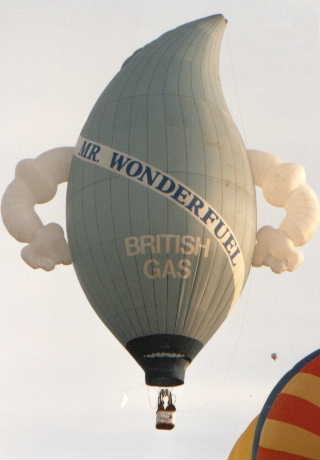 We cancelled the Ride Balloon inspection and set about trying to get Mr Wonderfuel back together. Bit by bit we worked our way back up piecing together folds of fabric and jagged tears to determine quite what exactly was and wasn’t there. 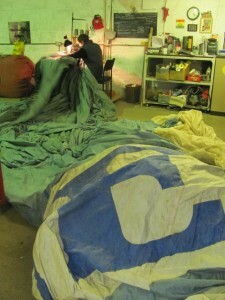 By lunchtime we’d got to the top and found the ‘missing panels scrumpled up amongst the internals. In the end, rather surprisingly, it appeared that all but a triangle of fabric was there but loadtapes were adrift all over the place. John reckoned a just-to-tether repair looked possible. 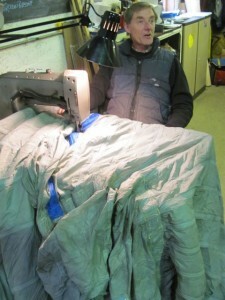 He leant back at his Jonsew, had a B&H and pondered over a repair scheme. Some of the tear could be stuck together with tape and sewn down each side. In other places the tear could be overlapped, sewn, and the ripped off load tape sewn down over the damage. The missing fabric he’d work out once the rest of the panels were sewn in. If it appeared a bit wobbly up the load tape it wouldn’t matter too much, we decided. 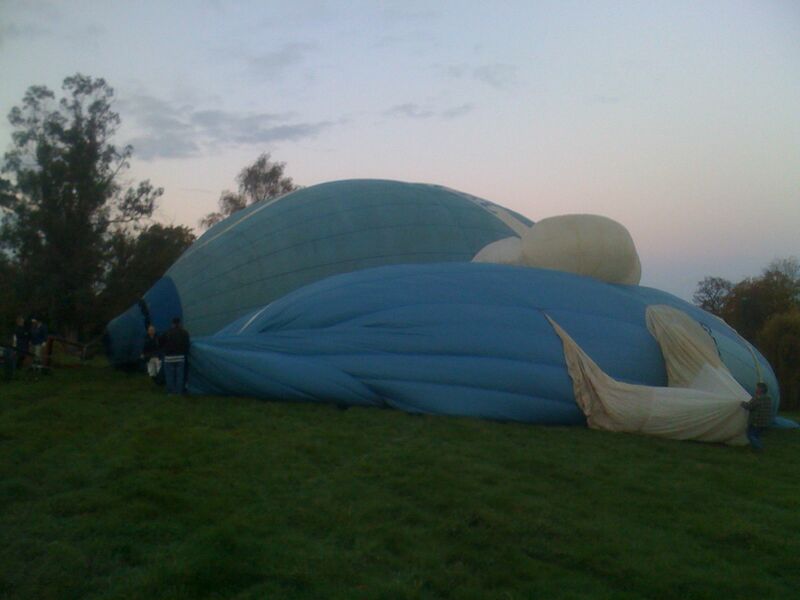 It would be remarkable if it kept the air in long enough to inflate never mind stand upright. Now with a plan he set about the old chap like a man possessed. Starting at the top he stuck the tear together on the outside with a slight overlap using masking tape in three foot lengths then turned it over and used some old repair tape we’d had in the cupboard for eons to stick up the inside. Turning it back over the masking tape was removed and the repair tape sewn down each side then the load tape over that. Seemed to work a treat. Horizontal seams and tapes were lined up as they appeared and repaired in the same fashion. Here and there it was easy enough just to overlap the torn edges and sew them together. It was going quite well and from the outside you’d never know. Then he got to the mass of torn panels. Now into the swing of it the same method was used. Jagged holes became panels, panels became gores again and all was looking good. At first it seemed that the missing triangular bit of fabric may not have been missing at all so he gave it a shut and sew but it soon became apparent that there was about four inches missing. 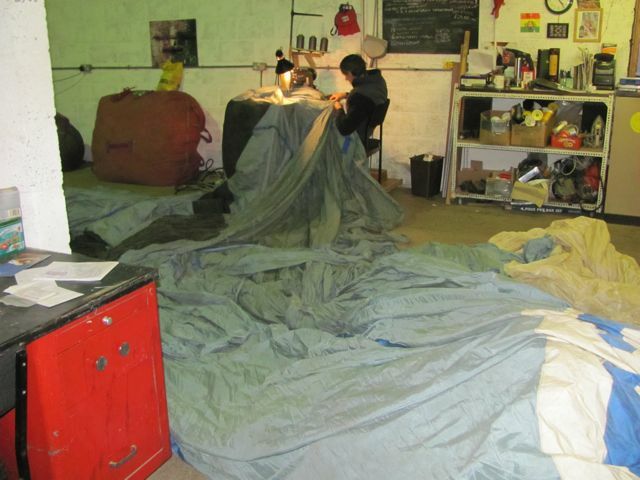 Keeping very relaxed he unpicked the panel again, measured it all up and in went a bit new fabric, shock horror. Happy hour in the Swan came and went but the rip, tears and associated damage was all mended. John resembled a snowman. A bit of a split at the mouth was seen off in double quick time. Back up the pointed end we put the rip panel in, convincing the Capewell to close with a copious amounts of WD40, a wire brush and swift smack with a copper-hide hammer (Thor No2). Ten minutes later it was back in the bag and, as far as we could tell, stood a reasonable chance of getting inflated providing two fans, plenty of fuel, double burners and a bucket full of determination was applied. So, a bit of history. 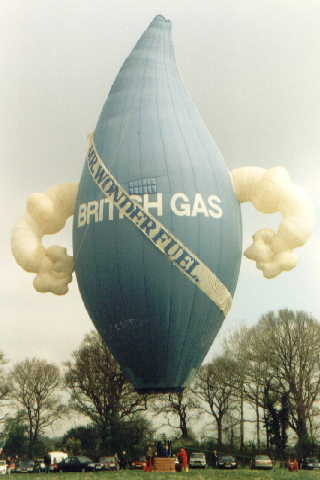 The older balloon, G-BGOO, known affectionally as Mr Flame, or Mr Gas, was built in Oswestry for British Gas by Colt Balloons Limited with serial number 039 and registered as a Colt Gas Flame-56 SS first flying on 13th May 1979 initially operated by The Hot Air Balloon Company Ltd (later becoming part of Flying Pictures). It was originally built without the banner (hence the poor fit) and no dump valve. G-BLKU, serial number 572, was also a Colt Flame-56 built in Oswestry by what had then become Thunder & Colt and first flew in 1984 and again initially operated by The Hot Air Balloon Company Ltd then based in Chelsea, London. One of G-BGOO’s first outings was with Colin Prescot in June 1979 to Chateau Balleroy in France for the renowned Forbes Balloon Meet. Not being used to the new shape, and it being windy to boot, he gallantly took off with a tad too much heat to clear the trees that surround the well-sheltered launchfield. As he careered upwards above the treetops he met the wind sheer and the top of the balloon collapsed as it tried to climb through it. In true heroic fashion he did the best thing possible and squatted in the basket while the fabric cracked and flapped about above him. Eventually it sorted itself out but from the ground it looked like the end was nigh. Having no dump valve he had been unable to check the climb but as soon as he was back in Blighty that was the first priority and off it went to have one fitted! It was simply a small rectangular flap that was actually pretty useless but it gave you a rope to pull and had some sort of psychological effect that a degree of control could be had. When G-BLKU was built it had a larger more effective one already fitted but this could actually do more harm than good! I had a similar experience with G-BLKU from the Shrewsbury Show. It was windy that day as well and what you didn’t appreciate at first was that pointy things don’t suffer from false lift, they just lean rather nonchalantly in the breeze making you think they are not hot enough so, you heat them up some more. 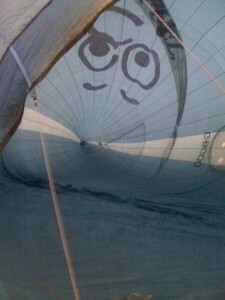 I’d flown Mr Flame before in much calmer conditions so should have realised my folly early on and the impending adventure. Next to me in the arena was Malcolm ‘Bear’ Campbell in George the Bear. I should have twigged it by the way it was leaning at a very jaunty angle spilling beer everywhere. I had a bowler-hatted fellow from the Arena Party on board and decided a short hop into the carpark would be far enough. I glanced across at Bear, he was laughing and shaking his head as I squirted a large gob-full of heat out the C2 burners and let go the quick release. It shot up like a home sick angel, spinning and whipping about like a thing demented and at one stage it appeared to be ninety degrees to the basket! Bowler Hat seemed unconcerned, repeating everytime his old school came into view as we cork-screwed through the air “I say, I went to school there!”, “I say, I went to school there!” I wrapped my arms around a flexi-rigid and hung on until it stopped thrashing its way skywards and just hoped that the Capewell would stay locked. Just like Colin’s experience it eventually rounded out at about five thousand feet and a rather more controlled descent into the first available field ensued, luckily by a pub, but, by now, quite a few miles away from the Show. By the time we got back, somewhat happier and relaxed, George was just about packed away and Bear was still laughing. After that we developed the running take-off for the shapes if it was a bit windy. A couple of weeks later, calling into Thunder & Colt factory for a cuppa, Chris Kirby asked if I’d been flying the Flame at the Shrewsbury Show. It turned out he’d witnessed the thing come flying up from behind the trees as his train pulled into Shrewsbury station. Small world. 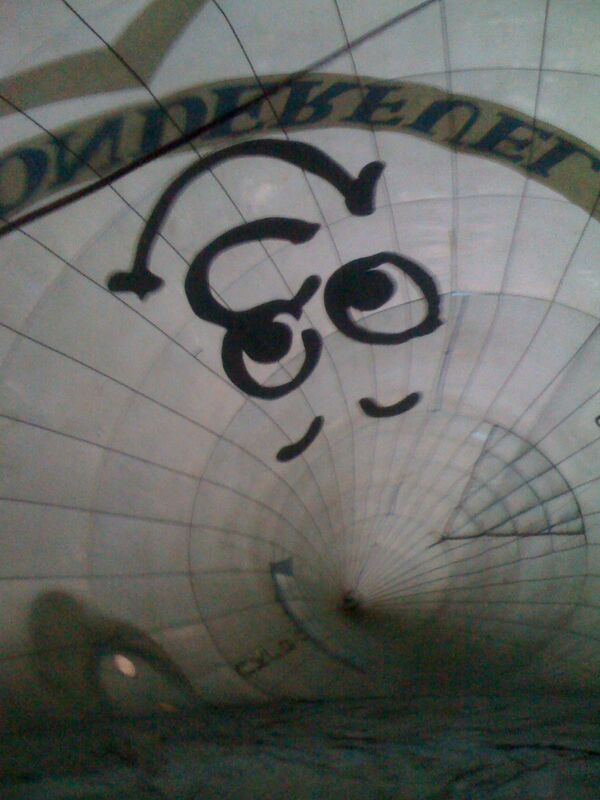 Now some of you may remember that laid-back Aussie John Medlock, better known for flying the round Budweiser balloon. He too flew the Flame and recalled that he almost killed himself in G-BGOO in 1988. John explained that the photographer on board tangled his lens in the red line at 1000ft over the Yorkshire Sculpture Park. Despite very carefully disentangling the line from camera, at 10 ft above the landing he accidentally released the Capewell which promptly plummeted towards the basket ripping all the Velcro out on the way. 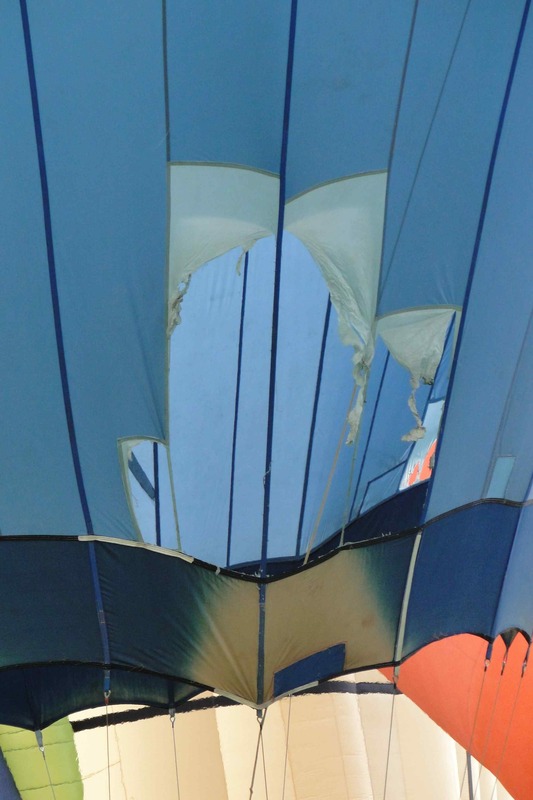 Needless to say the landing was swift and abrupt with the Flame continuing to deflate vertically after terra-firma was hit gift wrapping the basket and occupants. John said, “The Memory still gives me the horrors”. I seem to recall that there was a Henry Moore Exhibition on at the time and he managed to miraculously miss all the sculptures. Astonishing. For most of their life the Gas Balloons were flown by Joe Philp very ably assisted by his missus Heather. 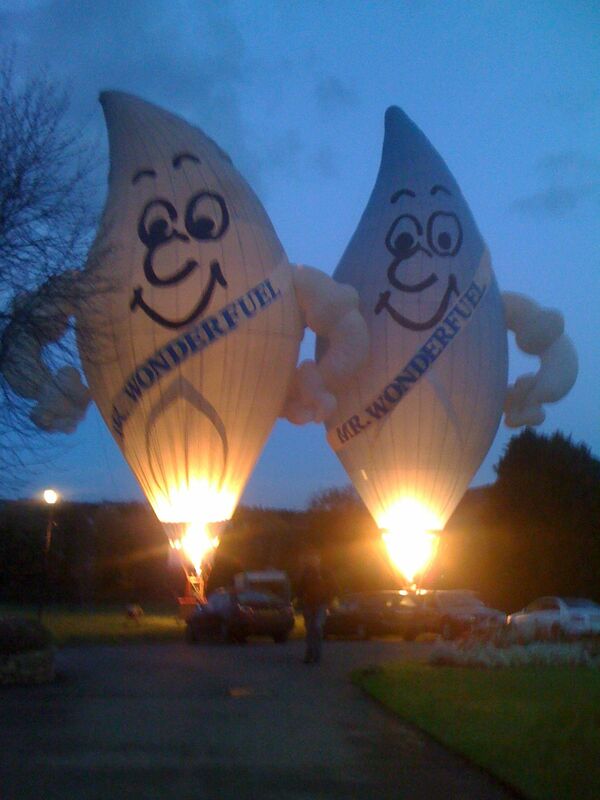 They attended most of the major County Shows and Balloon Events. With their jolly smiles the Flames were happy characters and very true to their animated advertising counterparts. After Joe Philp retired both Trish Watkins and Sue Carden nursed G-BLKU into the air until it was realised that it couldn’t really carry enough fuel for a sustained flight. G-BGOO was de-registered by the CAA 01/05/92 and G-BLKU was permanently withdrawn from service on 01/05/92 both were then donated to the British Balloon Museum & Library by Flying Pictures. We may well have another look at G-BGOO and see if he would be worth getting airworthy again but for now both envelopes are in an inflation-only state. [Editor's note: we've opened up comments on this article, and hope to do so on more, so that you can contribute... provided that the spammers don't get too hard to manage! The first time you post, you'll be asked for some identifying details, but once we've checked out that you're pukka, and approved your first comment, it should appear. Subsequent posting should then be easier. Let us know, please, if that's not the case for you!